Arabinoxylan is an abundant polysaccharide in industrially relevant biomasses such as sugarcane, corn stover and grasses. However, the arabinofuranosyl di-substitutions that decorate the xylan backbone are recalcitrant to most known arabinofuranosidases (Abfs). In this work, we identified a novel GH51 Abf (XacAbf51) that forms trimers in solution and can cope efficiently with both mono- and di-substitutions at terminal or internal xylopyranosyl units of arabinoxylan. Using mass spectrometry, the kinetic parameters of the hydrolysis of 33-α-l-arabinofuranosyl-xylotetraose and 23,33-di-α-l-arabinofuranosyl-xylotetraose by XacAbf51 were determined, demonstrating the capacity of this enzyme to cleave arabinofuranosyl linkages of internal mono- and di-substituted xylopyranosyl units. Complementation studies of fungal enzyme cocktails with XacAbf51 revealed an increase of up to 20% in the release of reducing sugars from pretreated sugarcane bagasse, showing the biotechnological potential of a generalist GH51 in biomass saccharification. To elucidate the structural basis for the recognition of internal di-substitutions, the crystal structure of XacAbf51 was determined unveiling the existence of a pocket strategically arranged near to the − 1 subsite that can accommodate a second arabinofuranosyl decoration, a feature not described for any other GH51 Abf structurally characterized so far. In summary, this study reports the first kinetic characterization of internal di-substitution release by a GH51 Abf, provides the structural basis for this activity and reveals a promising candidate for industrial processes involving plant cell wall depolymerization. Arabinoxylan is a hemicellulosic polysaccharide composed of a β-1,4-linked xylose backbone, which can be mono-substituted (at O-3) or di-substituted (at O-2 and O-3) with α-L-arabinofuranosyl residues (Araf) and eventually with (4-O-methyl) glucuronic acid [1, 2]. Industrially relevant biomasses such as sugarcane , corn stover  and grasses are rich in arabinoxylans, which can represent up to 50% (w w−1) of their polysaccharides in the secondary wall . Moreover, arabinoxylans from cereals stimulate the activity of beneficial bacteria in the colon of humans and animals, being considered a source of prebiotic oligosaccharides with promising health-promoting properties [5, 6]. To consume arabinoxylans, the microorganisms produce a set of glycoside hydrolases including α-l-arabinofuranosidases (EC 3.2.1.55) to release the Araf decorations, endo-β-1,4-xylanases (EC 3.2.1.8), which depolymerize the backbone, and β-xylosidases (EC 3.2.1.37) to convert xylooligosaccharides into xylose. Xylanases are mainly categorized into families 10 and 11 of glycoside hydrolases (GH) and often display low tolerance to substitutions . 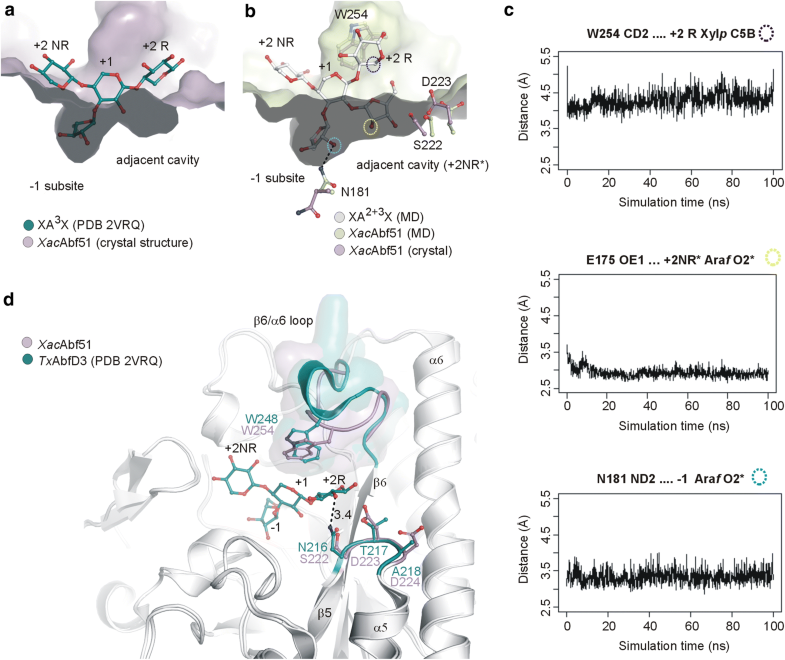 GH10 xylanases can accommodate substitutions at + 1 subsite, but not at − 2, − 1, and + 2 subsites , whereas the active site of GH11 enzymes requires at least three non-substituted residues in tandem for catalysis . 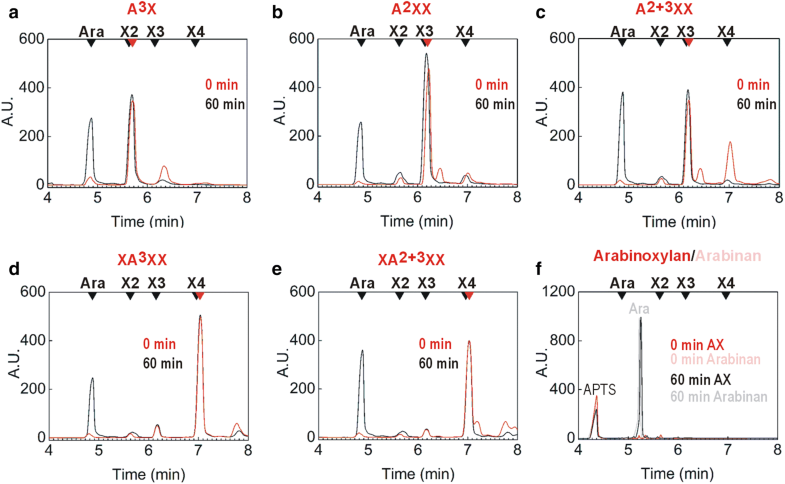 Thus, GH10 and GH11 xylanases demand the prior removal of Araf decorations by α-l-arabinofuranosidases to best convert xylan into xylooligosaccharides. α-l-Arabinofuranosidases (Abfs) hydrolyze non-reducing Araf groups of polysaccharides such as arabinoxylans and arabinans. They are mainly found in the GH families 43, 51, 54 and 62 and proven to have a positive effect on the enzymatic hydrolysis of pretreated wheat straw [7, 10]. In general, the characterized Abfs from family 62 seem to be specialized in cleaving Araf residues from mono-substituted xylopyranosyl (Xylp) units , whereas, in family GH43, some enzymes are specific for mono-substitutions [12, 13] and others recognize O3-linked Araf moieties from di-substituted xylan [14–16]. More generalist Abfs that release Araf from both mono- and di-substituted Xylp residues have been found in GH51 and GH54 families [17–20]. However, the molecular adaptations that allowed some GH51 Abfs to cleave di-substitutions remain elusive. In addition, the capacity of these enzymes to cleave di-substitutions has been mainly analyzed qualitatively without a kinetic characterization using di-substituted arabinoxylooligosaccharides (AXOs) [13, 19–22]. Thus, in this work, we reveal a novel generalist GH51 enzyme that forms trimers in solution and can cope with both mono- and di-substitutions in arabinoxylans, with biotechnological potential for biomass saccharification. For the first time, the kinetic characterization by mass spectrometry was described for a di-substituted AXO and the structural basis for di-substitution recognition in the GH51 family was elucidated. The enzyme XacAbf51 fused to an N-terminal His-tag was recombinantly expressed in Escherichia coli cells and purified to homogeneity by metal-affinity and size-exclusion chromatography. The melting temperature (Tm) assessed by circular dichroism spectroscopy (CD) and differential scanning calorimetry (DSC) is around 67 °C (Fig. 1a–c), indicating enhanced thermotolerance compared to other glycoside hydrolases from X. axonopodis pv. citri, which usually have a Tm between 45 and 55 °C . XacAbf51 cleaves the synthetic substrate pNP-Araf, which confirms its α-l-arabinofuranosidase activity (EC 3.2.1.55). It is very stable over time, remaining active up to 45 days, when stored at 4 °C (not shown), and retaining more than 80% of its activity after 55 h incubated at 50 °C (Fig. 1d). The prominent thermotolerance and activity of XacAbf51 in conditions akin to those used for enzymatic hydrolysis in biorefineries led us to evaluate the biotechnological potential of this novel Abf as a complement in fungal enzyme cocktails used for sugarcane bagasse degradation, since arabinoxylan is an important component of this biomass . As expected, the addition of XacAbf51 in celluclast and RUT-C30 enzyme cocktails enhanced the hydrolysis of delignified sugarcane bagasse in near 20%, indicating that XacAbf51 might be a useful additive in enzyme formulations for sugarcane bagasse saccharification (Fig. 1e and f). 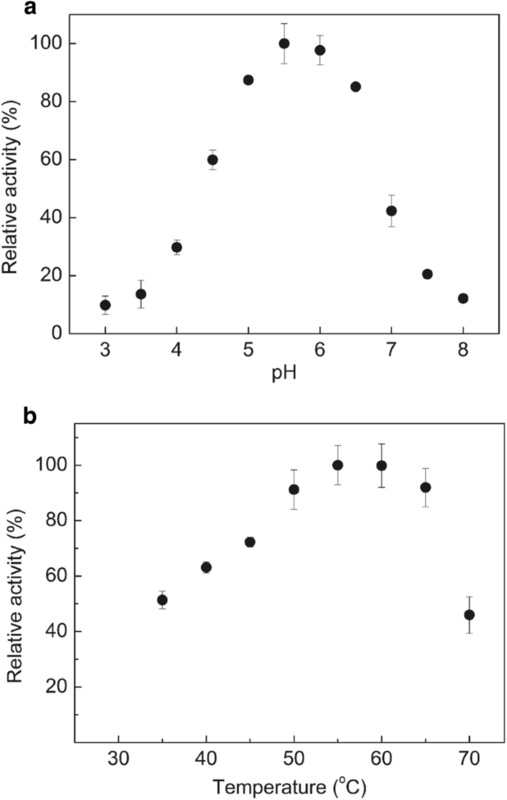 To better understand the catalytic properties of XacAbf51, we characterized the influence of pH and temperature on enzyme activity and investigated its substrate specificity. Maximum catalytic rates were observed at pH 5.5 (Fig. 2a) and temperature between 55 and 60 °C (Fig. 2b), which is fully compatible with the reaction conditions of commercial fungal enzyme cocktails. Besides pNP-Araf, XacAbf51 also cleaves natural polysaccharides such as arabinoxylan and arabinan (Table 1). A comparison of the reaction with arabinan and arabinoxylan at 10 mg mL−1 indicates that the enzyme cleaves arabinan better than arabinoxylan. The enzyme was not able to cleave pNP-Xylp and arabinogalactan, indicating a high specificity for Araf residues linked to xylan or arabinan backbones. Kinetic parameters of XacAbf51 and TxAbfD3 on pNP-Araf and arabinan and comparative activity of XacAbf51 and TxAbfD3 on arabinoxylan. The higher activity of XacAbf51 on arabinan as compared to arabinoxylan prompted us to investigate whether the enzyme TxAbfD3 (EC 3.2.1.55) from T. xylanilyticus—a GH51 member highly active on arabinoxylan —displays the same behavior. In contrast to XacAbf51, the enzyme TxAbfD3 was more active on arabinoxylan than on arabinan, showing that distinct substrate preferences occur within the family GH51, despite their capacity to recognize several substrates. According to capillary zone electrophoresis data, XacAbf51 releases arabinose from arabinoxylan as well as from mono- and di-substituted Xylp residues located at the non-reducing end or within the backbone of AXOS (Fig. 3). 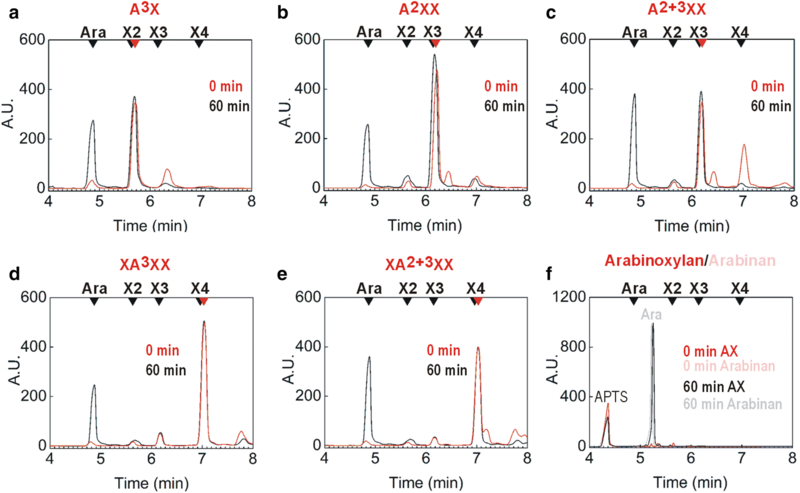 To better characterize the action of XacAbf51 on internal (di)-substitutions, we monitored the enzymatic hydrolysis of 23, 33-di-α-l-arabinofuranosyl-xylotetraose (XA2+3XX) and 33-α-l-arabinofuranosyl-xylotetraose (XA3XX) using mass spectrometry. In the reactions containing XA2+3XX as substrate, we detected the product xylotetraose but not mono-substituted AXOS, indicating that XacAbf51 cleaves both Araf moieties from internal di-substitutions (Fig. 4a). The enzyme showed a kcat of 9.6 ± 0.5 s−1 and Km = 4.97 ± 0.48 mM against the di-substituted substrate (kcat/Km = 1.8 × 103 s−1 M−1), although higher specificity was observed for the O3-linked mono-substitution (kcat= 73.3 ± 0.9 s−1, Km = 2.82 ± 0.08 mM, kcat/Km = 2.5 × 104 s−1 M−1), which agrees with the lack of detection of mono-substituted intermediates in the XA2+3XX hydrolysis (Fig. 4a). The homologous enzyme TxAbfD3 (15 µg mL−1), which was active against XA3XX (v0/[E]t = 88.5 ± 2.6 s−1 at 10 mM substrate), displayed 20-fold lower activity against the di-substituted substrate XA2+3XX (v0/[E]t = 0.40 ± 0.03 s−1 at 10 mM substrate) compared to XacAbf51 (v0/[E]t = 7.96 ± 0.85 s−1) assayed in the same conditions, indicating that XacAbf51 underwent molecular adaptations to better cleave di-substituted AXOS. To investigate the molecular mechanisms by which XacAbf51 cleaves AX di-substitutions, we solved and analyzed its crystal structure. As a typical GH51 enzyme, XacAbf51 harbors the active site in a (β/α)8-barrel that is tightly associated with a β-sandwich domain. The β-sheets of this β-sandwich put the N- and the C-terminal regions of the barrel together, stabilizing these two regions that otherwise would be labile (Fig. 5a). Thus, although not participating in the catalysis, the β-sandwich domain seems to be essential for the catalytic domain stability. 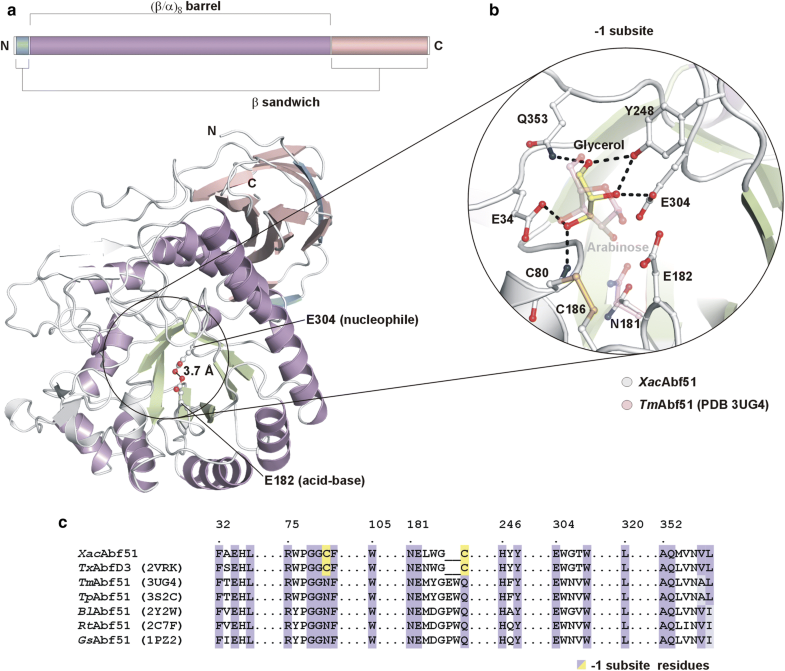 Structural comparisons revealed that XacAbf51 displays all structural features required for the retaining mechanism of hydrolysis conserved in GH51 enzymes [25–27]. The catalytic residues Glu182 (acid–base) and Glu304 (nucleophile) are positioned 3.7 Å apart from each other within the active site pocket (Fig. 5a). A glycerol molecule occupied the − 1 subsite in a conformation that mimics part of the Araf ring (Fig. 5b). All residues from this subsite are identical or semi-conserved between XacAbf51 and GH51 structures known so far, except for Cys80 and Cys186. These cysteine residues form a disulfide bridge in XacAbf51 and TxAbfD3, which likely contributes to the high thermostability of these enzymes . In other GH51 Abfs, Cys80 and Cys186 residues are replaced by asparagine and glutamine (Fig. 5c). Although Asn181 is fully conserved between the compared GH51 Abfs, it adopts a different rotamer in XacAbf51 (Fig. 5b). Structural superimposition of XacAbf51 with TxAbfD3 in complex with 32-α-l-arabinofuranosyl-xylotriose (XA3X) evidenced the presence of a cavity near to the − 1 subsite that could potentially accommodate the second Araf substitution of a di-substituted substrate (Fig. 6a). To gain insights into the molecular events involved in binding and hydrolysis of Araf from internal di-substituted Xylp residues, we appended an O2-linked Araf at XA3X, thus generating XA2+3X, and carried out a molecular dynamics (MD) simulation of XacAbf51 complexed with this di-substituted substrate. According to this simulation, the side chains of Ser222 and Asp223 adopted different rotameric conformations to better accommodate the O2-linked Araf at the +2NR* subsite (Fig. 6b). The side chain of Asn181 rotated 180° around Cβ to interact with the O2 atom of the arabinofuranosyl residue at the − 1 subsite. Trp254 formed hydrophobic interactions with the +2R Xylp residue, but no hydrogen bonds were observed between the enzyme and the xylan backbone, which correlates with the versatility of XacAbf51 in recognizing both arabinoxylan and arabinan. 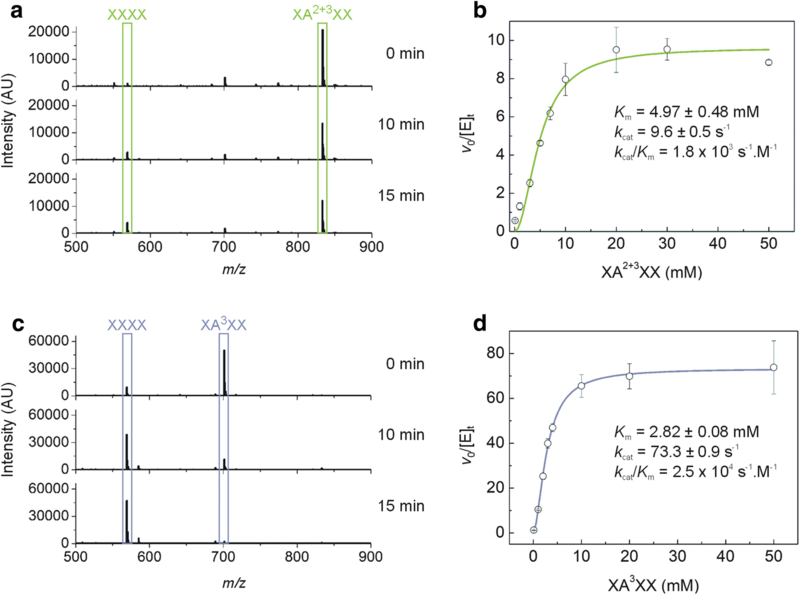 Selected inter-atomic distances between enzyme and XA2+3X remained stable over the simulation, indicating favorable interactions for substrate binding (Fig. 6c). Thus, the MD simulation data support that the pocket adjacent to − 1 subsite can accommodate the O2-linked Araf from internal di-substituted Xylp residues, while the O3-linked decoration is placed into − 1 subsite for catalysis. Considering the pseudosymmetry of xylan and the design of catalytic interface, the backbone might also bind to the active site in the inverted direction, placing, in this case, the internal O2-linked Araf (from mono- or di-substitutions) into − 1 subsite for cleavage. In TxAbfD3, we observed variable regions at β6–α6 and β5–α5 loops that might explain its low activity against internal di-substitutions. The β6–α6 loop contains the tryptophan residue that interacts with the + 1 Xylp unit in TxAbfD3, but makes hydrophobic contacts with the + 2 Xylp residue in XacAbf51 (Fig. 6d). To test the influence of β6–α6 loop in substrate preference, the sequence TIPGGWPPRASST (Thr249-Thr261) and two extra residues (Ala310-Pro311) of XacAbf51 were replaced by the sequence TVPGPWEKKGPAT and DV of TxAbfD3, because the aspartic residue from the DV motif interacts with β6–α6 loop in TxAbfD3. CD analysis indicated a folded conformation of the mutant (data not shown); however, it was inactive against arabinan and arabinoxylan and poorly active against pNP-Araf. Another point of divergence between XacAbf51 and TxAbfD3 is the sequence SDD (Ser222-Asp224, β5–α5 loop) of XacAbf51, which is replaced by the NTA (Asn216-Ala218) motif in TxAbfD3, attracting the +2 Xylp unit via a hydrogen bond donated by Asn216 (Fig. 6d). This three-residue replacement caused enzyme aggregation, as assessed by Dynamic Light Scattering (DLS), and disrupted the enzyme activity against arabinoxylan and arabinan (results not shown). We also tested whether the triple replacement of β6–α6 loop, DV and SDD motifs would convert the substrate preference of XacAbf51 to that of TxAbfD3. Although the mutant showed a folded conformation with a similar hydrodynamic radius (Rh) to the WT enzyme, the triple modification also abolished the XacAbf51 activity against arabinoxylan and arabinan, indicating that other structural features might affect the positioning and dynamics of β6–α6 and β5–α5 loops, impairing activity when associated with transplanted loops. In the crystal structure of XacAbf51, six protein chains compose the asymmetric unit, but in a different spatial disposition from that observed for known GH51 hexamers such as TxAbfD3  (Fig. 7a). Analysis of the crystal interfaces using jsPISA  indicates that trimers, composed by ABC or DEF chains, are the most stable quaternary structure of XacAbf51. Moreover, the interface between the dimer of trimers that compose the TxAbfD3 hexamer is not conserved in XacAbf51. To determine the oligomeric state of XacAbf51 in solution, several experiments were carried out with the purified protein. 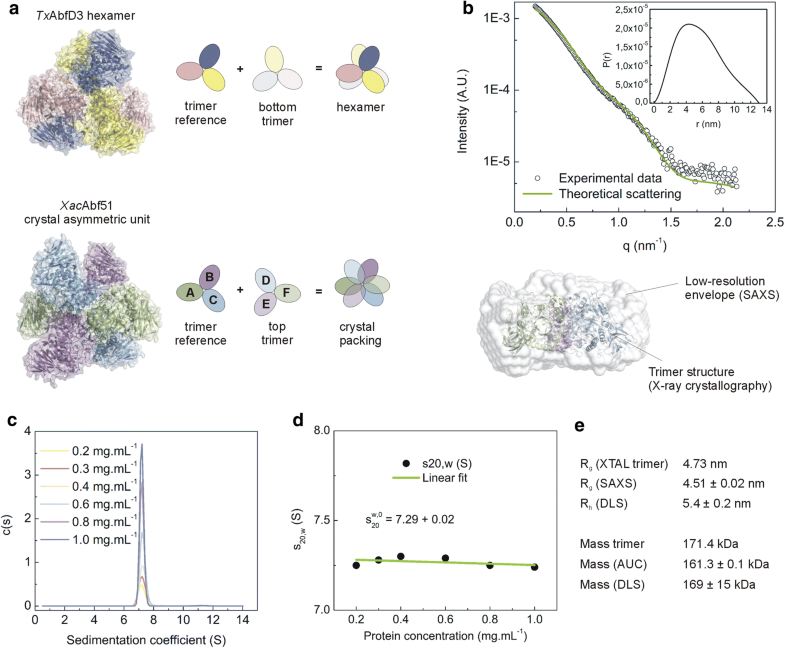 The small angle X-ray scattering (SAXS) curve of XacAbf51 revealed a radius of gyration (4.5 nm) and a low-resolution molecular envelope that are consistent with the crystallographic trimer (Fig. 7b). Moreover, the sedimentation coefficient estimated from analytical ultracentrifugation (AUC) at different protein concentrations (Fig. 7c and d) corresponds to a particle of 161 kDa, which is in accordance with the theoretical mass of the trimer (171 kDa). Estimation of Rh using DLS (Fig. 7e) further supported that the biological unit of XacAbf51 is a trimer. To gather insight into the evolution of GH51 Abfs, a phylogenetic tree was constructed based on the catalytic domain of characterized GH51 enzymes and their respective paralogues (Fig. 8). This phylogenetic reconstruction shows two major clades (clades I and II) referent to a gene duplication that occurred early in evolution, as indicated by the presence of genes from the two clades in Thermotoga petrophila, a species from a deep phylogenetic branch in the tree of life . Members of clade I are abundant in bacteria, whereas those of clade II are found mainly in plants and fungi. The division in two major clades reflects two main types of modular architecture. In clade I, most enzymes display the (β/α)8 barrel + β-sandwich composition, but, in clade II, the proteins have an extra N-terminal domain which resembles carbohydrate-binding modules (CBM) from families 4, 6 or 11 (Fig. 8). 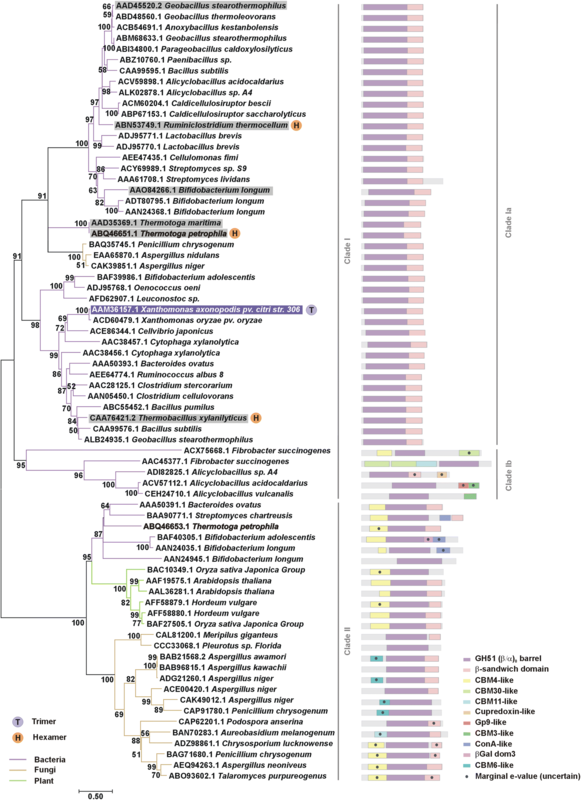 Interestingly, enzymes with β-1,4-glucanase activity, found only in specific bacteria from Fibrobacter and Alicyclobacillus genera (clade Ib), have peculiar and diverse domain arrangements, indicating they emerged from gene duplication and recombination events. In these enzymes, the (β/α)8 barrel is usually fused to one or more copies of putative cellulose-binding modules (CBM 3, 11 and 30). Moreover, unconventional domains (Gp9-like and cupredoxin-like) are detected in two endoglucanases from Alicyclobacillus sp. To date, the only structures available for the GH51 family comprise Abfs from clade Ia with the (β/α)8 barrel + β-sandwich composition. Except for XacAbf51, which is a trimer, the other structures reported so far are hexamers, indicating that the molecular diversity of GH51 enzymes include changes in quaternary structure besides modular rearrangements. The capacity to cleave α-1,2 and α-1,3 Araf decorations in arabinoxylan and/or arabinan as well as α-1,5 bonds in arabinan is observed in Abfs from both clades I and II, evidencing the structural plasticity of the GH51 active site [13, 20, 31–37]. This study reports the first Michaelis–Menten kinetic parameters for the cleavage of internal Araf di-substitutions by a GH51 Abf and provides the structural basis for this activity. Cleavage of terminal di-substitutions in AXOS has been reported for some GH51 enzymes, but internal di-substitutions have been described as poor or non-cleavable substrates [17–20]. Our data reveal a novel GH51 enzyme that releases both Araf residues from internal di-substitutions with a catalytic constant of ~ 10 s−1. Although our data do not resolve the XacAbf51 preference between O2 or O3 linkages, they reveal that the first cleavage of a di-substitution is the rate-limiting step of the reaction catalyzed by XacAbf51, leading to a tenfold lower kcat/Km for the di-substituted compared to the O3-mono-substituted substrate. For almost all GH51 enzymes characterized so far, kinetic parameters have only been assessed using synthetic substrates (pNP derivatives), probably because of the high-cost and limited availability of AXOS allied to the low response stability and time-consuming characteristic of HPAEC-PAD analyses . To overcome such bottlenecks, we used mass spectrometry to monitor the enzymatic hydrolysis of mono(di)-substituted arabinoxylotetraoses—a fast, direct and highly sensitive approach that requires minimum amounts of substrate (in this study, we acquired each data point in 1 min and used less than 10 mg of substrate for a complete enzyme characterization). Thus, we envisage the mass spectrometry as a useful, fast and precise alternative, not only for future studies of GH51 enzymes, but also to assess Michaelis–Menten kinetics of oligosaccharide hydrolysis by other GHs, as previously reported for xylanases . The positive effect of XacAbf51 in the saccharification of delignified sugarcane bagasse may be useful for the development of enzyme cocktails optimized for this biomass. Supplementation of fungal cellulases mixtures with hemicellulases and auxiliary enzymes, including a GH51 Abf, has already been shown to increase the conversion of AFEX pretreated corn stover into monosaccharides . Here we evidence that this approach is also valuable to increase the hydrolysis yield of pretreated sugarcane bagasse. The cellulolytic fungi T. reesei displays three Abfs (GH43, GH62 and GH54), but is devoid of GH51 enzymes . Thus, our data support that the XacAbf51 capacity of releasing terminal and internal di-substitutions of AXOS might improve the performance of widely used cellulolytic enzyme cocktails over arabinoxylan-rich biomasses. Our structural data compared to those of GH62 and GH43 Abfs (EC 3.2.1.55) contribute to a better understanding of the molecular determinants for distinct substrate specificities in Abfs. GH62 enzymes specialized in mono-substitutions display a single arabinose-binding pocket in the middle of a long cleft where the xylan backbone binds (Fig. 9a). As proposed by Maehara and coworkers, the pseudosymmetry of xylan backbone and the active site topology of Araf62A likely allows arabinoxylan to bind into the cleft in two opposite directions to, respectively, allocate the O3- and O2-linked mono-substitutions at the − 1 subsite . 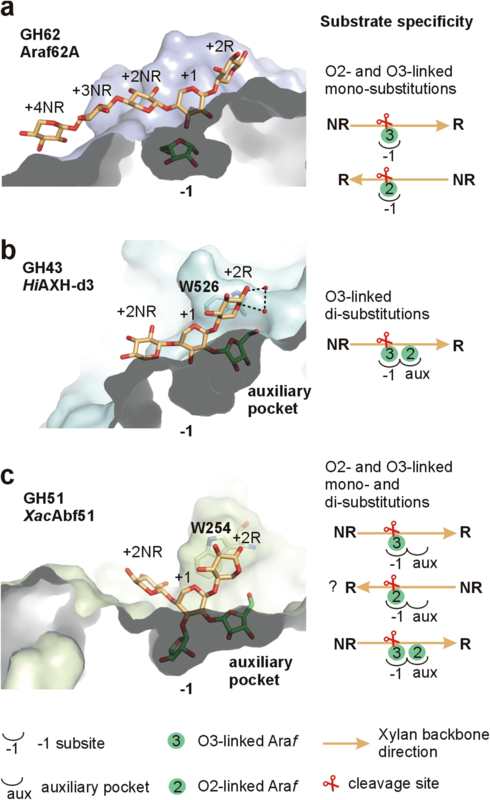 Differently, in the GH43 enzyme HiAXH-d3, which is specific for O3-linked Araf from di-substitutions, an auxiliary pocket accommodates the second Araf decoration and solvent-mediated hydrogen bonds (involving Trp526 and the ring oxygen of +2R Xylp) selects a single orientation of the xylan backbone, in a manner that the catalytic pocket is always occupied by the O3-Araf moiety (Fig. 9b) . Similar to HiAXH-d3, XacAbf51 also displays an auxiliary pocket to accommodate the second substitution of di-substituted substrates (Fig. 9c). However, the residue Trp254 (equivalent to Trp526 of HiAXH-d3) makes a π-stacking interaction with +2R Xylp, which does not depend on the endocyclic oxygen, the only asymmetric feature of xylan. Thus, according to these analyses, it is plausible to suggest that the active site of XacAbf51 allows the bidirectional binding of arabinoxylan and AXOS to cleave O2- and O3-linked Araf from mono- or di-substitutions. The positioning of Trp254 seems to play a role in di-substitution recognition. However, our mutational strategy to test this hypothesis (β6–α6 and/or β5–α5 loops transplantation from TxAbfD3 to XacAbf51) inactivated XacAbf51 instead of changing its substrate specificity, indicating an incompatibility that may require secondary mutations or the reverse transplant (from XacAbf51 to TxAbfD3) to attain the expected functional changes. All GH51 proteins whose structure is currently available are bacterial enzymes from Clade Ia (Fig. 8). The oligomeric state of only three of them has been validated in solution [TpAbf51, ; TxAbfD3 (AUC data not shown) and XacAbf51 (Fig. 7)] and served as a guide to map how the quaternary structure of GH51 enzymes evolved. The hexameric arrangement, which can be seen as dimer of trimers, seems to have appeared early during evolution of GH51 family, being found in the Thermotoga genus, a deep lineage back to the early forms of bacteria [30, 43]. The hexameric arrangement remained stable in other thermophilic bacteria, such as Ruminiclostridium thermocellum (jsPISA prediction, ) and T. xylanilyticus ), but, in the mesophilic X. axonopodis pv. citri, the dimer of trimers was disrupted, giving rise to a trimeric enzyme. Based on these data, we suggest that the ancient GH51 arabinofuranosidases from clade I formed hexamers—possibly to withstand extreme conditions of high temperature—and that colder environments favored the emergence of trimeric enzymes, at least during X. axonopodis pv. citri speciation, changing the paradigm that GH51 Abfs are exclusively hexameric. According to ConSurf analyses , the trimer interface, which is close to the active site, harbors residues more conserved than those assembling trimers into hexamers, indicating that the trimeric arrangement may be more crucial than the hexameric configuration for enzyme function. In summary, our study expands our knowledge about the diversity of GH51 Abfs in terms of tertiary and quaternary structure and provides the structural basis for the release of internal Araf di-substitutions by a generalist Abf that copes with all types of Araf decorations in arabinoxylan and arabinan. The rare mode of action of XacAbf51, along with full pH and temperature compatibility with current fungal enzyme cocktails, is very attractive for industrial applications, especially in technologies for the production of fermentable sugars using arabinoxylan-rich biomasses such as sugarcane, corn stover and grasses. The nucleotide sequence encoding XacAbf51 (GenBank AAM36157.1) was amplified from the genomic DNA of X. axonopodis pv. citri str. 306 using the following oligonucleotides: 5′- CAT ATG CCG GCC AGC TTC GCT G -3′ and 5′- AAG CTT TCA TTG CAG CTT GAG CAT CAC GAT CG -3′. It was cloned into pET28a after digestion with NdeI and HindIII restriction enzymes. The annotated sequence begins with GTG codon but upstream sequence analysis indicated additional 27 nucleotides (beginning at ATG) that are part of the signal peptide according to PROSECTO (http://www.lge.ibi.unicamp.br/lnbio/prosecto.htm). The signal peptide was removed during cloning for expression in E. coli. The DNA sequences of mutants I (containing 249-TVPGPWEKKGPAT-261 and 310-DV-311 instead of 249-TIPGGWPPRASST-261 and 310-AP-311), II (containing 222-NTA-224 instead of 222-SDD-224) and III (mutations I + II) were produced in pET28a vector, between NdeI and XhoI restrictions sites, by GenScript (Piscataway, NJ). The construct TxAbfD3 (GenBank CAA76421.2) cloned into pET21a between NdeI and HindIII restriction sites was also purchased from GenScript (Piscataway, NJ). XacAbf51 and mutants were expressed in Escherichia coli Origami™2(DE3) cells in Terrific broth medium (1.2% (m v−1) tryptone, 2.4% (m v−1) yeast extract, 0.4% (v v−1) glycerol, 17 mM sodium phosphate monobasic monohydrate, 72 mM sodium phosphate dibasic) supplemented with 50 µg mL−1 kanamycin. The culture was grown at 37 °C, 225 rpm, until the O.D.600nm has reached 1.0, transferred to 20 °C for 1 h, and then incubated with 0.25 mM isopropyl β-d-1-thiogalactopyranoside (Sigma-Aldrich, St. Louis, MO) for 18 h at 20 °C, 170 rpm. The TxAbfD3 protein was produced in E. coli BL21 (DE3) cells grown in Luria–Bertani medium supplemented with 100 µg mL−1 ampicillin, following the same protocol used for XacAbf51. The cells were collected, resuspended in lysis buffer (20 mM sodium phosphate, pH 7.5, 500 mM NaCl, 5 mM imidazole, 1 mM PMSF, 0.5 mg mL−1 lysozyme), incubated on ice for 30 min and disrupted by sonication. The soluble extract was applied into a 5-mL HiTrap Chelating HP column (GE Healthcare, Little Chalfont, UK), previously charged with Ni2+, coupled to an ÄKTA purifier (GE Healthcare, Little Chalfont, UK), at a flow rate of 2 mL min−1. The target proteins were eluted using a non-linear (0–0.5 M) gradient of imidazole. The fractions containing pure proteins were pooled, concentrated and applied into a HiLoad 16/600 Superdex 200 pg column (GE Healthcare, Little Chalfont, UK), previously equilibrated with 20 mM sodium phosphate, pH 7.5, and 150 mM NaCl, coupled to an ÄKTA purifier (GE Healthcare, Little Chalfont, UK) at a flow rate of 1 mL min−1. Arabinose, pNP and 4-nitrophenyl-α-l-arabinofuranoside (pNP-Araf) were purchased from Sigma-Aldrich, St. Louis, MO. Wheat flour arabinoxylan, sugar beet arabinan and AXOS were purchased from Megazyme, Co. Wicklow, IE. For the thermotolerance assay, XacAbf51 was incubated at 50 °C for up to 72 h and samples were collected to measure activity against pNP-Araf in McIlvaine buffer (pH 5.5) at 50 °C, for 10 min, using 0.5 µg mL−1 (9 nM) enzyme and 10 mM substrate. The generation of p-nitrophenolate from pNP-conjugated monosaccharides was monitored at A400nm (ε400nm, pH 12 = 17,500 mol−1 L cm−1). Activity against arabinoxylan at 10 mg mL−1 was measured in McIlvaine buffer (pH 5.5) at 50 °C, for 10 min, using 15 µg mL−1 XacAbf51 (263 nM) or 16 µg mL−1 (278 nM) TxAbfD3 and the generation of arabinose from polysaccharides was determined by the 3,5-dinitrosalicylic acid (DNS) method . To determine the kinetic properties of XacAbf51 and TxAbfD3, the reactions were performed in McIlvaine buffer (pH 5.5) at 50 °C, for 10 min, in the range from 7 µM to 14 mM of pNP-Araf using 0.5 µg mL−1 (9 nM) XacAbf51 or 0.1 µg mL−1 (2 nM) TxAbfD3 and from 0.3 to 140 mg mL−1 of arabinan using 263 nM XacAbf51 or 278 nM TxAbfD3. The kinetic parameters were calculated by non-linear regression analysis of the Michaelis–Menten plot using the program OriginPro 8.1. To estimate initial rates, the reactions were made in triplicate with 5 µL of oligosaccharide (XA3XX or XA2+3XX) in different concentrations (0.2–100 mM), 3 µL of McIlvaine buffer at pH 5.5, 1 µL of water and 1 µL of XacAbf51 stock at 150 µg mL−1 (final enzyme concentration = 15 µg mL−1). After 5 min of incubation at 50 °C, 700 rpm, 40 µL of methanol was added to quench the reaction. Assays to compare the relative activity of XacAbf51 and TxAbfD3 on 23,33-di-α-l-arabinofuranosyl-xylotetraose (XA2+3XX) or 33-α-l-arabinofuranosyl-xylotetraose (XA3XX) were performed incubating XacAbf51 (15 µg mL−1) or TxAbfD3 (15 µg mL−1) with 10 mM substrate, at pH 5.5, 50 °C, 700 rpm, 5 min (reaction volume = 10 µL) and quenched with 40 µL of methanol in triplicate. The kinetic assays were monitored on a Waters Synapt HDMS, at V mode and ESI(+) with a spray voltage maintained at 3.0 kV and heated to 130 °C in the source. A total of 15 µL of the quenched reactions and 2 µL of 1 mM xylotriose (used as the internal standard) were added to 183 µL of water and injected into the mass spectrometer in scan mode (m/z 300–900) with direct infusion at a flow rate of 50 µL min−1. An internal standard with ionization similar to analytes (xylotriose) was used to increase the reliability of the method . A calibration curve was made to determine the concentrations of the products of the enzymatic reaction. The kinetic parameters of the reactions (kcat, Km and Vmax) were determined by non-linear regression analysis (Hill model) of the Michaelis–Menten plot using the software Origin8.1. For capillary zone electrophoresis analysis, reactions were incubated for 60 min at 50 °C, pH 5.5, using 100 µg mL−1 XacAbf51 and 10 mM AXOS, or 20 mg mL−1 arabinan, or 20 mg mL−1 arabinoxylan. Arabinose, xylobiose, xylotriose and xylotetraose (5 mM) and reactions without enzyme were used as standard references. Samples were heated at 95 °C, for 5 min, centrifuged and 30 µL of the supernatant was dried using Speed-Vac (Thermo Fisher Scientific, Waltham, MA). Reaction products were derivatized with 8-aminopyrene-1,3,6-trisulfonic acid (APTS)  by incubation with 20 µL 2.5 M citric acid, 8 µL 1 M sodium cyanoborohydride (in THF) and 1.5 µL 100 mM APTS (in 25% (v v−1) acetic acid), for 2 h at 75 °C. Labeled reactions (4 µL) or negative controls without enzyme (2 µL) were diluted to a final volume of 60 µL using run buffer (0.04 M potassium phosphate, pH 2.5) and injected into an uncoated fused-silica capillary of 75 µm internal diameter and 20 cm effective length (Beckman Coulter, Brea, CA), by application of 0.5 psi, for 5 s, using a P/ACE MDQ instrument configured with a laser-induced fluorescence detection system (Beckman Coulter, Brea, CA). Electrophoretic conditions were 20 kV/70–100 mA with reverse polarity at a controlled temperature of 25 °C. Carbohydrates labeled with APTS were excited at 488 nm and emission was collected through a 520-nm band pass filter. The strain T. reesei Rut-C30 was cultivated on Petri dishes containing potato dextrose agar (Difco, MI). After 6–10 days, spores were collected in spore solution (20% (v v−1) glycerol, 0.8% (m v−1)NaCl, 0.025% (v v−1) Tween 20), filtered through sterile cotton, quantified using a hemocytometer and frozen at − 80 °C for long-term storage. Fermentations were performed using the BioFlo/CelliGen 115 system (Eppendorf, Hamburg, Germany) and water-jacketed 3.0-L vessels. The fermentation medium comprised of 5% (m v−1) milled soybean hulls, 5% (v v−1) milk whey, 2% (m v−1) (NH4)2SO4 and 1 mL L−1 of J647 antifoam (Struktol, Hamburg, Germany) in the batch phase and milk whey with lactose concentration of 177 g L−1 were fed from 72 to 170 h at an average rate of 0.5 g L−1 h−1 total sugar. Aeration was maintained at 1.0 VVM compressed air, pH between 3.8 and 4.8 using 2 M phosphoric acid and 10% ammonia, and DO above 30% with an agitation cascade (400–950 rpm). The initial volume was 1 L, and the reactors were inoculated with 1:10 volume of 7-day-old shake flask preculture using the same media composition as the fermentation batch medium, spore concentration in the inoculum bottle was 2.5 × 107 in 100 mL. Samples were withdrawn every 24 h, centrifuged at 21,000×g for 10 min and the supernatants stored at − 20 °C for analysis. Whole broth samples were adjusted to pH 5.0, frozen at − 20 °C and used for hydrolysis assays. Fermentations were terminated after 170 h when the feeding was stopped. For quantifying protein, the sample was first diluted to a final concentration of 0.3–1.5 g L−1 in 50 mM Na citrate buffer, pH 5.0. A 200 μL sample was combined with 800 μL ice-cold acetone, mixed by inverting the tube several times and then maintained at − 20 °C for 1 h. The precipitated proteins were pelleted by centrifugation at 14,000×g and 4 °C for 5 min. The supernatant was removed and the pellet was air-dried for 5 min before resuspending in the original volume (200 μL) of buffer. The protein concentration was then quantified using the DC protein kit (BioRad, Hercules, CA) based on the method of Lowry  using bovine serum albumin as standard. Delignified sugarcane bagasse was prepared using an alkaline pretreatment (130 °C, 30 min, 1.5% m v−1 NaOH), yielding a material composed by 58.6% cellulose, 22.1% hemicellulose, and 8.8% lignin. Enzymatic hydrolysis reactions were performed in samples of 1 mL containing 5% of dry biomass (50 mg) and 237.5 µg of enzyme cocktail, supplemented or not with 12.5 µg XacAbf51, in buffer 50 mM sodium citrate, pH 5.5, with 0.02% sodium azide. The reactions were done in triplicate and incubated in a hybridization oven at 50 °C with agitation during 24 h. The enzyme cocktails used were Celluclast (Novozymes, Krogshoejvej, Denmark) and the whole broth from T. reesei RUT-C30, prepared as described above. Protein concentration was estimated by the Lowry method  using the DC protein kit (BioRad, Hercules, CA). CD spectra were acquired on a JASCO J-815 CD spectrometer (Jasco, Tokyo, Japan) controlled by a CDF-426S/15 Peltier temperature control system using a quartz cuvette with a 1-cm path length. The enzyme was prepared in phosphate buffer (20 mM sodium phosphate, 150 mM NaCl, pH 7.5) at a final concentration of 8 µM. All spectra were obtained at 20 °C in the range 195–260 nm with a bandwidth of 2 nm and a response time of 4 s nm−1. CD spectra were buffer subtracted and normalized to mean residue ellipticity. Thermal unfolding experiments were monitored at 220 nm in the temperature range 20–90 °C with a scan rate of 1 °C min−1. The melting temperature was determined according to the sigmoidal-Boltzmann fitting of the CD denaturation curve. Thermal stability was also analyzed by DSC using a VP-DSC device (Microcal, GE Healthcare, Northampton, MA). The enzyme was prepared in phosphate buffer (20 mM sodium phosphate, 150 mM NaCl, pH 7.5) at a final concentration of 2 mg mL−1. 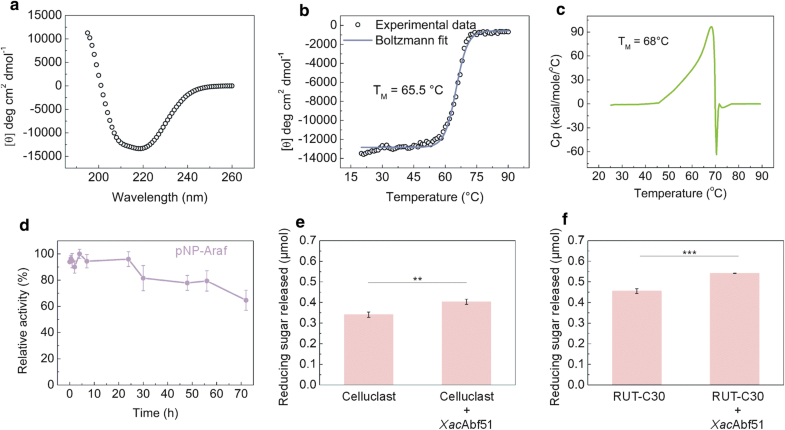 A temperature rate of 1 °C min−1 was used and the reversibility of protein denaturation was tested. Denaturation curves were buffer subtracted, concentration normalized and the resultant endotherms integrated following assignment of pre- and post-transition baselines. Size distribution of the purified enzyme in solution was evaluated using DLS. Measurements were acquired at 20 °C on a Malvern Zetasizer Nano ZS 90 (Model no. ZEN3690, Malvern, Worcestershire, UK) with a 633-nm laser, in a quartz cell with a scattering angle of 90°. The protein was analyzed at a concentration of 0.5 mg mL−1 in phosphate buffer (20 mM sodium phosphate, 150 mM NaCl, pH 7.5). An average of 20 runs was used to estimate the Rh through Stokes–Einstein equation. Sedimentation velocity experiments were performed on a Beckman Optima XL-A analytical ultracentrifuge (Beckman Coulter, Indianapolis, IN) at 20 °C. Spectra were collected at both 220 and 280 nm. The protein was prepared in different concentrations ranging from 0.2 to 0.9 mg mL−1 in phosphate buffer (20 mM sodium phosphate, 150 mM NaCl, pH 7.5). AUC data were analyzed using the continuous sedimentation distribution method in the SEDFIT program . The s020,w value at infinite dilution was calculated by linear regression of s20,w as a function of protein concentration. Small angle X-ray scattering measurements were performed at three different concentrations (2, 4 and 6 mg mL−1) in 20 mM Tris buffer, pH 7.5. Data were collected at SAXS2 beamline (LNLS, Campinas, Brazil), integrated using Fit2D  and analyzed using GNOM . The molecular envelope was calculated from the experimental SAXS data using the program DAMMIN . Ten runs of ab initio shape determination yielded highly similar models (normalized spatial discrepancy values < 1), which were then averaged using the package DAMAVER . The theoretical scattering curves of crystallographic structures were calculated and compared with the experimental SAXS curves using the program CRYSOL . The crystallographic structure was fitted into the SAXS molecular envelope using the program SUPCOMB . XacAbf51 (27 mg mL−1) crystallized by vapor diffusion method in sitting drops containing 17% (w v−1) polyethylene glycol 3350 and 0.2 M ammonium chloride. Crystals were cryoprotected using the reservoir solution added of 20% (v v−1) glycerol. Diffraction data were collected at the BL12-2 beamline from the Stanford Synchrotron Radiation Lightsource (Stanford, CA). Data were processed using XDS  and the structure was solved by molecular replacement method using the program MOLREP and the atomic coordinates of TxAbfD3 (PDB ID: 2VRQ) as search model. Six chains were found in the asymmetric unit and the model was refined against electron density using COOT  and against X-ray data using phenix.refine  and REFMAC . Final model was validated using MolProbity . Data collection, processing and refinement statistics are summarized in Table 2. Superimposition of XacAbf51 crystal structure with that of TxAbfD3 in complex with 32-α-l-arabinofuranosyl-xylotriose (XA3X) was performed with PDBeFOLD  and the coordinates of the ligand positioned into the XacAbf51 active site were transferred for the PDB file containing one trimer of XacAbf51. An Araf substitution was added to XA3X to generate XA2+3X and simulation systems using explicit solvent were created for energy-minimized trimeric structures of XacAbf51 in complex with XA2+3X. Energy minimization and MD simulations were carried out using YAMBER3 force field with the program YASARA . Long-range Coulomb interactions were included with a cutoff of 7.86 Å. The simulation box was defined at 15 Å around all atoms of the structure. Protonation was performed at pH 7. Cell neutralization was reached filling the box with water molecules (d = 0.997 g mL−1) and Na/Cl counter ions (0.9% m v−1) coupled with a short MD simulation for solvent relaxation. MD simulations were performed during 100 ns at 298 K, using a multiple time step of 2.0 fs for inter-molecular forces, 1.2 fs for intra-molecular forces, periodic boundary conditions and unconstrained bonds and angles. Root mean square deviations (RMSDs) were calculated for the whole system and Euclidean distances between enzyme and substrate atoms were measured through the trajectory in the three active sites of the trimer and the average value is presented in function of the simulation time. The sequences of characterized GH51 enzymes present in the CAZY database, excluding redundant sequences (sequences from the same species with > 95% sequence identity) and synthetic constructs, were manually edited to include only the fragment corresponding to the (β/α)8 barrel, as predicted by the webserver SUPERFAMILY . The edited sequences were aligned using the software MUSCLE, available at the EMBL-EBI webserver (https://www.ebi.ac.uk/Tools/msa/muscle/) . The multiple sequence alignment was provided for the MEGA7 software to perform evolutionary analyses . Initial tree(s) for the heuristic search were obtained automatically by applying Neighbor-Joining and BioNJ algorithms to a matrix of pairwise distances estimated using a JTT model, and then selecting the topology with superior log likelihood value. A discrete Gamma distribution was used to model evolutionary rate differences among sites [five categories (+G, parameter = 1.9905)]. The rate variation model allowed for some sites to be evolutionarily invariable ([+I], 1.20% sites). The analysis involved 72 amino acid sequences. All positions with less than 80% site coverage were eliminated. That is, fewer than 20% alignment gaps, missing data, and ambiguous bases were allowed at any position. There were a total of 292 positions in the final dataset. The confidence of tree topology was assessed using the Bootstrap analysis based on 1000 bootstrap replications . CRS and MTM designed the study. CRS, POG and MTM wrote the paper. POG made the figures and the phylogenetic analyses. VPMM and FB constructed vectors for expression and established the heterologous expression protocol. CCCT purified and crystallized the protein. MABM determined and refined the structure. RVH and PSLO performed the molecular dynamics simulations. FHMS and MND characterized the enzyme activity by colorimetric methods. LMF produced the T. reesei RUT-C30 enzyme cocktail. MND performed the enzyme complementation assays. RASP and FCG carried out the mass spectrometry analyses. LMZ characterized the biophysical properties of the protein. All authors analyzed the results of the manuscript. All authors read and approved the final manuscript. We are thankful to Brazilian Synchrotron Light Laboratory (LNLS) and Brazilian Biosciences National Laboratory (LNBio) for the provision of time on the SAXS2 beamline, and both crystallization (Robolab) and spectroscopy (LEC) facilities. We are also thankful to Stanford Synchrotron Radiation Lightsource (SSRL) for the provision of time on the BL12-2 beamline. The atomic coordinates for the crystal structure of XacAbf51 were deposited at the Research Collaboratory for Structural Bioinformatics Protein Databank (http://www.rcsb.org/) under PDB ID 6D25. This research was supported by grants from Fundação de Amparo à Pesquisa do Estado de São Paulo (FAPESP) [Grants #2013/13309-0, #2014/07135-1, #2014/17264-3 and #2015/26982-0], Conselho Nacional de Desenvolvimento Científico e Tecnológico (CNPq) and Coordenação de Aperfeiçoamento de Pessoal de Nível Superior (CAPES).